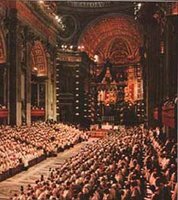 The council suggests that the Divine Office is the cornerstone of the spiritual life of the clergy. The one hang-up I see is the heavy expectation placed on a communal monastic format transferred to what is, for most priests, a quasi-eremitic life. The communal format is, after all, what seminarians are experiencing in their training. Perhaps some clergy readers would care to chime in on the benefits, challenges, and disappointments of this ideal? Priests who are engaged in the sacred pastoral ministry will offer the praises of the hours with greater fervor the more vividly they realize that they must heed St. Paul‘s exhortation: “Pray without ceasing” (1 Thess. 5:11). For the work in which they labor will effect nothing and bring forth no fruit except by the power of the Lord who said: “Without me you can do nothing” (John 15: 5). That is why the apostles, instituting deacons, said: “We will devote ourselves to prayer and to the ministry of the word” (Acts 6:4).